Magistral Tourbillon by Girard-Perregaux (Swiss, Founded 1791). Approximate Cost: 158 315.00 GBP. Part of the Haute Horlogerie collection, the Magistral Tourbillon is hand-wound. The see-through, 36-by-37 mm case reveals the beauty of Girard-Perregaux’s tourbillon movement and is water resistant down to 30 metres. On the dial reside two seashell-shaped indicators, one for the instantaneous calendar and the other for 110 hours of power reserve. Missing are: 2, 4, 8, and 10 o’clock! Perhaps Girard-Perregaux became widely known due to a co-branding partnership agreement with Ferrari, the Italian motor car company, between 1994 and 2004. This has been replaced by the yachting sector with the BMW-Oracle Racing collection. 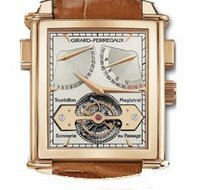 Girard-Perregaux Tourbillons are known for having three gold bridges and no other watch manufactured during our times goes back as far: the first tourbillon with three gold bridges dates from 1889. They do a popular Art Deco style ‘Vintage 45’, Tonneau and the famous Opera 1, Opera 2 and Opera 3s. Now part of SoWind Group that includes Jean Richard and EMG. This entry was posted on Monday, January 16th, 2006 at 21:11 and is filed under Design Specials, Wristwatches. You can follow any responses to this entry through the RSS 2.0 feed. You can leave a response, or trackback from your own site.